So it's just dawned on me that the 31 Day Challenge starts in less than a week and I have a whole bunch of unposted mani's to get through. I'm really going to have to lift my posting schedule to get through them all. For anyone participating in the 31 Day Challenge, like last year I have created in-linkz for every day. 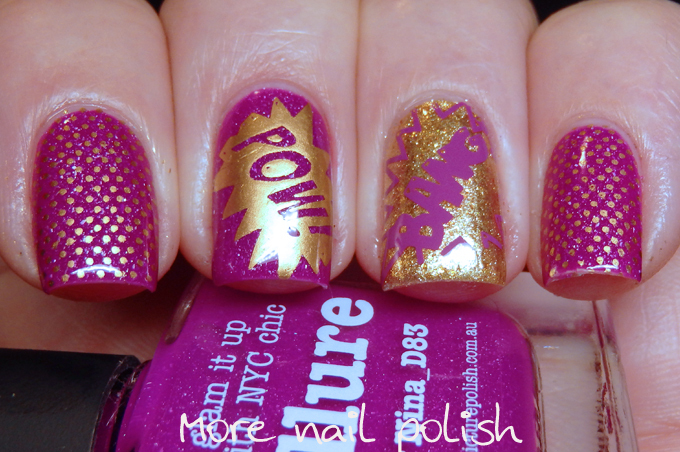 If you are a blogger, please remember to grab them for your blog so everyone can share our awesome manis. I liked the micro dot stamping so much on my last mani that I used it again. This time I teamed it up with other images from the same plate. So to the lovely ladies who asked which plate it was that I used last time, I actually just went through my pile of plates to find out which one it was. It's Moyou Pro Collection 10 plate. It has these micro dots as well as other pop art images- like the Pow and Bang ones. The polish I featuring here is Picture Polish Allure, a new collaboration shade with Nina_D83 on instragram. If you aren't already a follower, you should be. She posts incredible nail art and is known by her trademark 'scarf hand pose'. The other thing that is pretty amazing with her account is that if you look back to her first posts, they were just a flawless as her current ones. She doesn't have any questionable beginner photos like the rest of us! Allure is a bright magenta pink jelly with scattered holo. It's along the same lines as Picture Polish Mad Magenta, which is the creme sister to this polish. For this mani I stamped with Mundo de Unas gold and used Zoya Kerry on my ring finger and stamped with Mundo de Unas is some magenta colour that I don't know if it has a name or just a number. Here are my swatches of Allure on it's own. It has a great formula and lasted well on my nails. I used two coats and Seche Vite top coat for my swatches. I did find that adding top coat made the colour appear slightly darker compared to how it looked straight out of the bottle. 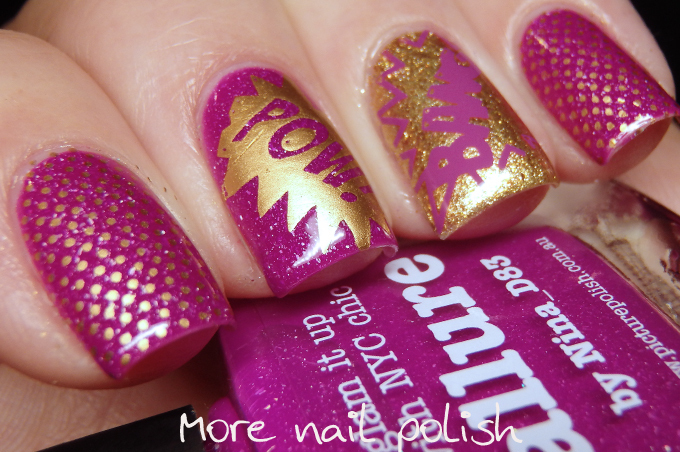 Picture Polish Allure is available from Picture Polish. International ladies may be able purchase through one of the many Network stockists if they have this in stock.